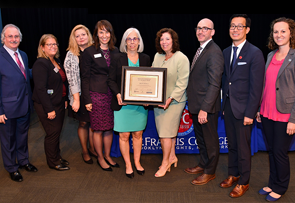 On September 19, Judy Willig accepted the Brooklyn Chamber of Commerce’s first Innovative Cornerstone Not-for-Profit Award for our 46-year history of serving Brooklyn’s older adults with innovative services and programs. The award was presented at the Chamber’s 6th Annual Not-for-Profit Summit that focused on Engaging an Aging Population. True to form, when accepting the award, Judy had something important to say about aging. Instead of thinking about older adults, those age 60 and better as “them” or “the other,” she suggested we would all do well to realize that we are all “aging” – a process that begins from the time we are born. When we advocate for and create programs and services to assist today’s 60+ Brooklynites, we are supporting a culture that values older adults and provides the assistance they – and we – may need to remain vital members of our communities.